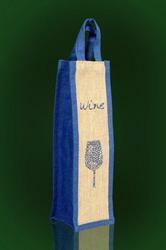 Manufacturer, exporter and supplier of Jute Wine_Bags. These are perfectly designed for carrying and storing wine_bottles and are offered in varied designs and sizes. Further, to give an attractive appeal, all our bags are dyed in vibrant colours. Manufacturer, exporter and supplier of Jute Wine Bags. These are perfectly designed for carrying and storing wine_bottles and are offered in varied designs and sizes. Further, to give an attractive appeal, all our bags are dyed in vibrant colours. With our years of experience and knowledge, we are engaged in offering a superior quality Jute Wine Bag. The bag offered by us is stitched & designed at our vendor's end using high-quality material and sophisticated technology.